In May 2016, Liebherr announces that the brand will stop commercializing its R 984 mining excavators for the retro and shovel versions. From now on customers will no longer be able to buy the excavator launched after 1986. Today the R 9100 and R 9150 track excavators succeeded the R 984. Since 1986, more than a third of the 120-ton models were delivered in Africa and a third in Europe. The last model was delivered in 2015 to carry out dragging operations in Algeria. Over the past few years, the R 984 mining excavator has been really famous. Indeed, this excavator is an extractor and loading tool renowned for its resistance and flexibility. 1,100 units had been sold worldwide for 30 years. During all these years, the excavator was nicknamed the "Swiss Army Knife"
The R 984 is generally used on quarries or opencast mines. However, the excavator is also used in another ways, as for example steelworks in Hamburg (Germany). This one can carry slags reaching a temperature higher than 1,000 ° C. For this type of operation, the Liebherr excavator has a grapple adapted for scrap handling. R 984 excavators C already have accumulated more than 60,000 working hours in coal mines of El Cerrejón based in Colombia. Today R 9100 and R 9150 Liebherr excavators replaced the R 984. The R 9100 is efficient and ideal to load 50 to 100 ton-construction trucks. 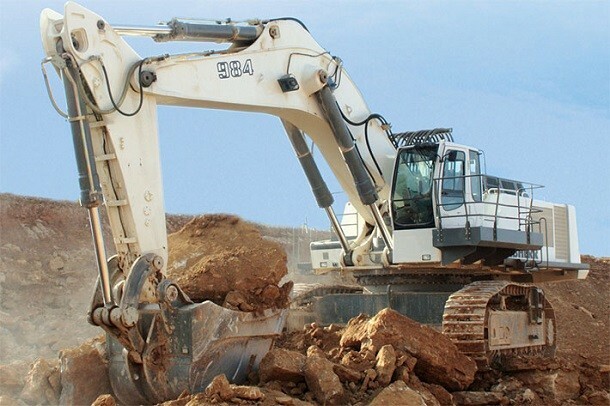 This excavator has an engine power of 565 kW with a rotation of 1,800 rev. The R 9150 Liebherr excavator succeeds to the R 984 C. Indeed it offers a high power of penetration (a maximum of 779 kN).